Sky Yoga classes are a unique offering you can share with your students as you all become part of the Sky Yoga community. Throughout our trainings, we create a holistic experience of exploring pranayama, mediation, philosophy, alignment, adjustments, anatomy, clear cueing, sequencing and teaching practice. All is specifically tailored to our silky Sky Yoga Hammocks, and to your own personal style of learning and teaching. Where yogic grounding meets sky energy. The technique of Sky Yoga is a holistic practice designed to both challenge your body and mind, whilst providing therapeutic benefits using the play of gravity with our Sky Yoga Hammocks. Our trainings aim to give you the confidence to lead powerful, intelligent and super fun and nourishing suspension yoga classes. Your asana practice will deepen. You will embrace your authentic self and find your voice. You will learn to empower others and hold space for transformation. MOVE YOUR BODY. STRETCH YOUR MIND. CHALLENGE YOURSELF TO GROW. The dynamic practice of Sky Yoga Flow is akin to the grounded yoga ‘Vinyasa’ experience. We utilise the hammock to support the body in Sky Yoga Postures, in a flowing sequence that moves with the breath. We strengthen and stretch, allowing an integration to create mobility and stability in the body. Fused with acrobatic postures, this style is an opportunity for you to explore your edges and challenge yourself, and others, through this training. All of the 5-day trainings are open to anyone, so you are most welcome to join even if you have already completed a Sky Training, if you’d like to delve into those Sky foundations again. Though for those who have completed a training, in the past or in any of these 5-day formats, then you have the opportunity to take the 3-day specific style option, as a 20-hour training format. The first two days of each of our trainings focus on the Foundations of the Sky Yoga Practice. This includes terminology, introductory anatomy, teaching methodologies and general Sky Hammock safety, use and technique. The 3 days following are where we dive into the specific practice (Flow, Restorative or Core, depending on which training you choose). This is where we hone our skills in this particular area in a more detailed and practical way. *Only for students that have completed another SKY YOGA training previously. You will leave this course with a 35-hours Yoga Alliance Accredited Continuing Education Certification. This course is compulsory for all new people taking any SKY YOGA Training for the 1st time. You will leave this course with a 20-hours Yoga Alliance Accredited Continuing Education Certification. This is only available to those who have completed a Sky Training in the past. These trainings are all held in the home studio of Radiantly Alive, Ubud. Surrounded by lush jungle in the heart of Ubud, you’ll find time also to explore the area and indulge in the incredible yoga and food options during the training. Though we always suggest coming days (or even weeks) earlier, and leaving a few days free after the training to really soak up the goodness. We’ll accept up to 18 trainees, which is the capacity of our room. Shae is devoted to sharing her passion for health and wellness in body and mind. As a Yoga Teacher, she guides her classes with an infusion of Mindfulness techniques, Yoga philosophy, empowering movement and nourishing love. Shae has successfully completed her 200hrs YTT with Louisa Seer of Yoga Arts and 300hrs of Training with Radiantly Alive. She is certified through Yoga Alliance with E-RYT 200, RYT 500 and YACEP (Yoga alliance Continuing Education Provider). She has assisted on a range of grounded and aerial Yoga Teacher Trainings to broaden her facilitation skills, as well as offer her insight and teaching to practitioners (Assister/Co-Teacher on Level 1 & 2 Sky Yoga YTT with Radiantly Alive & Acacia Jade). She believes that all movement - of both the body and the mind - is where we can shift our energies, find inner transformation, and cultivate a sense of freedom and compassion for ourselves, and others. 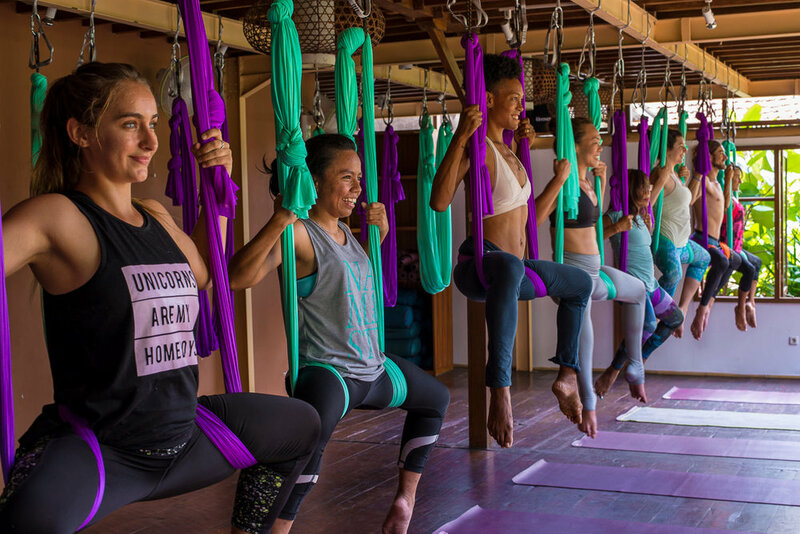 Personally trained by the founder of Sky Yoga, Acacia Jade (acaciajadeyoga.com), Shae has dived deeply into the world of Aerial Suspension Yoga with joy and passion. Her love of teaching soft, gentle and yin style Yoga classes is also how Shae became drawn to teaching and creating balanced, nurturing and deeply relaxing restorative Sky Yoga classes. The hammock suspension allows people to feel supported, embraced, and gives them permission to lie back, let go and absorb the nourishment. Pedro is a teacher of different styles of yoga, such as Hatha, Vinyasa and Aerial Yoga. Among all of them, he is a passionate Aerial Yoga teacher, a technique he dived into 3 years ago. Since his training, he has assisted on 15 Aerial and Yoga Teacher Trainings. Drawing from this self study and experience, he offers a deep focus of safety and alignment of using the Sky Yoga Hammock, to support a flowing and healthy practice. Pedro facilitates a truly uplifting experience in the versatility of all Sky Yoga Elements; uplifting flow, strengthening core, and healing therapeutics.